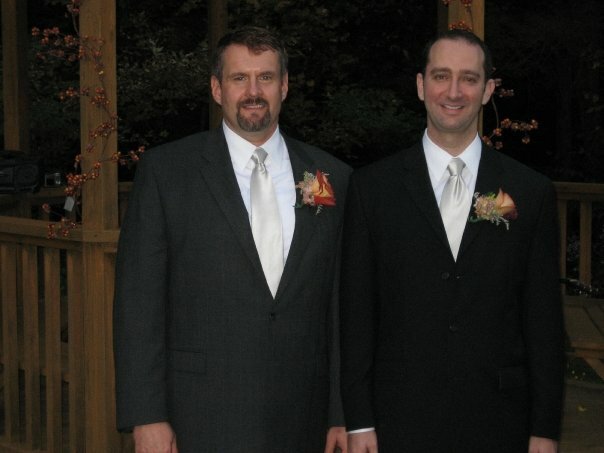 Seven years ago, in September of 2006, Chuck and I had a civil union in Stowe, Vermont. As Chuck eloquently put it (think Ben in Openly Straight), the civil union meant we were nearly married, any time we happened to be in Vermont. This was us seven years ago at the ceremony. Seven years later, because we can, Chuck and I are making our union official in the eyes of the government. On Saturday, Nov. 16, we are getting married! It’s a small ceremony. Including us and the person marrying us (Famous Author Rob Byrnes), there will be six of us in Central Park. We felt it didn’t make sense to have another huge event, since the one we had seven years ago is so firmly entrenched in our memory as our “marriage,” even if the IRS didn’t see it that way. That said, in recent days I’ve been overwhelmed with a feeling that I find it hard to describe. Pride? Gratitude? Jitters? There’s simply something about the word marriage that changes everything. In a good way. For me, I mean. This is an institution that millions upon millions of humans have embraced, throughout history. By getting married, I re-commit to Chuck. But I also join the rest of the world, in a way. I will be married. Not partnered. Partner is convenient, because it allows listeners to decide the gender of my partner. They can also decide that I mean business partner. Not so in marriage. Marriage is not a business relationship. It is rooted in love. And when I switch, in four days, from partner to husband, it will feel odd to me at first. But it’s also good. Because as much as I am like Rafe from Openly Straight, and sometimes I get the gay fatigue and don’t want to come out to every person I meet, it helps me be authentically me to announce that I have a husband. I do. Or I will. And having a husband makes me no less of a man than if I had a wife. In fact, to my way of thinking, it hits my personal definition of man in several ways: I am accountable to another for my actions. I am connected to another and to the universe. I share my gifts with a spouse. I stand up and get counted, telling people who I am even when it would be easier not to. So yeah. Bill Konigsberg gets married. I like the ring of it. I am humbled by it. It makes me want to be a better person. Love it- such a great post! I wish you the best of luck with your ceremony this weekend and hope it all goes well. I completely forgot this was in the works when I met you last Saturday; otherwise, I would’ve said something then (it was a crazy day!). Hugs to you and Chuck, and I’ll be thinking of you guys this Saturday. PS Loved Openly Straight- read about 100 pages while waiting in various lines at YALLFest after meeting you and then finished it the next day. I’m writing my review (lots of thoughts!) today but it won’t be up on the blog til January- may copy/paste it to Goodreads in the meantime. Congratulations to you and your husband. This is a beautiful post, and I will share it with the members of my church who have been discussing how we can support the campaign for the Freedom to Marry, which we hope to have on the Oregon ballot in November 2014. Part of our discussion was the difference between civil unions and marriage, and your post hit the nail on the head. “There’s simply something about the word marriage that changes everything.” I think you hit the nail on the head right there. Jeff and I got married in Canada back in 2005, and it definitely led us (and, I think, the people who know us) to regard our relationship in a more real, committed, permanent, and EQUAL sense than I had ever done before. “Joining the rest of the world” is a great way to put it. I like the ring of it too – and the ring! I love you BFF Bill Konigsberg, and as much as I wish I was marrying you, I guess that Uncle Chuck guy will do. My heart is so warm for the both of you. It’s a beautiful afternoon for a wedding! Hope you and Chuck have a wonderful and joyous day and a continued wonderful life.